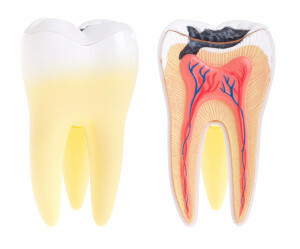 Sometimes, if a tooth has been damaged badly enough by trauma or repeated decay that has been untreated or required large restorations, the nerve (pulp) gets damaged and can become painful or infected. If this happens, the nerve space can usually be cleaned out and sealed to prevent reinfection. This is called a root canal. That word has a bad reputation because in the past this procedure wasn’t a lot of fun. However, with new technology and techniques, you don’t need to be afraid of a root canal anymore. During the procedure the tooth is completely numbed with local anesthetic. Then the hollow chamber inside the tooth is cleaned out and disinfected. Finally, a sealer is placed inside the canals to prevent bacteria from reinfecting the tooth. In most cases this procedure can be done in one appointment and helps patients keep their teeth for decades.